Having invested heavily in tourism since 2010, Batumi is quickly becoming a go-to destination for visitors looking for a bustling nightlife. The seaside town's appeal stems from the fact that it lacks the overwhelming crowds of long-time favorite beach towns. Named Best New Destination of the Year in 2012 by the American Academy of Hospitality Sciences, Batumi may not remain a well-kept secret for very long. The city's subtropical climate and location on the coast of the Black Sea draw visitors for beach holidays with a dose of history and culture. 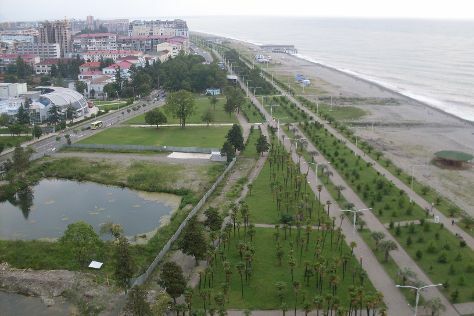 Batumi serves as the capital of Adjara, an autonomous republic located in the southwest, and as such offers a unique cultural experience within Georgia. The diversity of religious buildings delights visitors, as do the ancient ruins. Batumi is in Adjara Region. With the Inspirock international travel planner, Batumi and other destinations across the globe can be made central to your personalized travel plans. Thanks to a growing influx of wealthy visitors from surrounding nations, Batumi is increasingly awash with luxury hotels geared towards the city's casino industry. In addition to typical international luxury options, you'll find other upscale hotels located on Batumi's main promenade and along the waterfront. However, proximity to the water and beach usually means a much higher price tag. To keep costs low, consider staying a local hostel or guesthouse, which provide comfortable sleeping quarters while providing quick access to the remodeled city center and waterfront. As an added bonus, staff at local establishments may be able to give you insider recommendations for food, bars, and activities.